Using a strong password is the best way to protect your PC from unauthorized access. To make your computer more secure you can also use the account lockout policy to protect against hackers who try to break into your computer by repeatedly trying to guess your Windows login password. After a certain number of invalid login attempts, your Windows account will be locked out automatically. If an account gets locked out whether it’s on the local computer or domain controller, you will be denied to logon even if you know the correct password. So how to troubleshoot a locked-out Windows user account? In this tutorial I’ll show you how to unlock Windows user account that is locked out on Windows 8/7/Vista/XP and Windows Server 2008/2003/2000. To get started, we need to get Reset Windows Password utility, which comes as an ISO image file. After a while the bootdisk will launch the Reset Windows Password utility, which shows all Windows user accounts available for your Windows installation. Remove the CD or USB stick and restart the computer, you can then log in the Windows system using a blank password. The unlocking procedure is done! 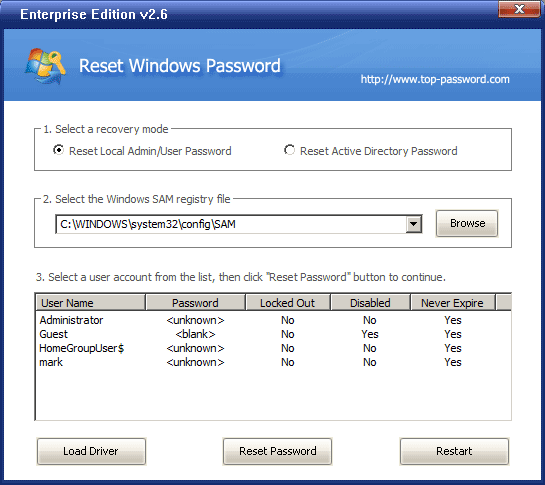 With Reset Windows Password utility, you can unlock both local administrator account and domain administrator account easily.